The Dutch company Atmos UAV has been selected by Naval Group for the testing of its innovative fixed-wing VTOL (Vertical Take Off and Landing) UAV solution for evaluation purposes. With this agreement, Naval Group deepens its existing commitments to the Dutch innovative industry building and expanding existing relationships with more than 70 companies and knowledge centres. On the occasion of the 30th edition of NIDV, the Netherlands Industries for Defence & Security exhibition held in Rotterdam, both companies have signed an agreement to explore a preliminary phase of the technology in the frame of a comprehensive UAV testing and integration programme. As a reputed surface and submarine vessels and combat systems integrator, Naval Group is very proud to announce this partnership with Atmos UAV. Atmos UAV specialises in innovative UAV solutions, and their fixed-wing vertical take-off and landing solution presents key operational opportunities for navies. “We are grateful leveraging the best innovative capabilities in the Netherlands, relying on a rich network of partners. New capabilities such as UAVs will play a key role in future operational requirements, and we believe that by testing them at a very early stage, Naval Group will be able to offer cutting-edge solutions to its international customers,” said CEO, Naval Group Netherlands, Mark van Rooij. 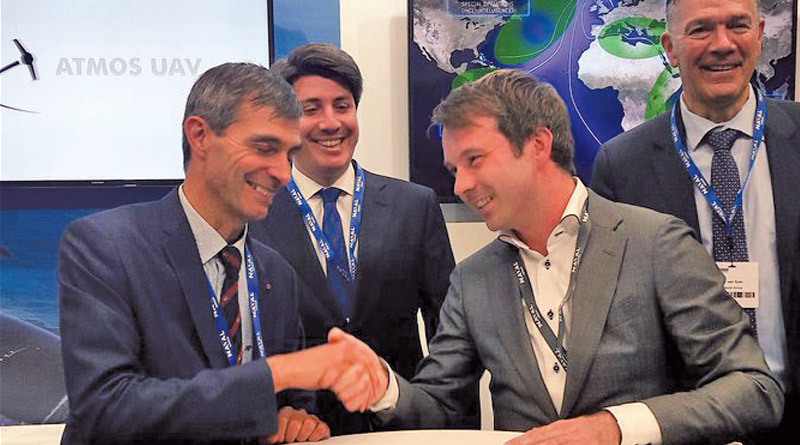 As the first step of this partnership, the two partners will closely work together to further detail and finalise the development plan of integrating Atmos UAVs’ capabilities in the operational environment of Naval Group’s systems.